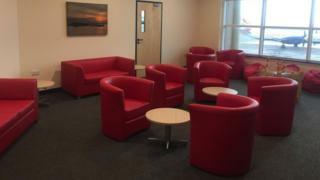 A special room for people who need to fly from the Isle of Man to England for hospital treatment has opened at the island's airport. The Manx Breast Cancer Support Group helped raise funds to provide the "quiet space" for patients in transit. The room is open to anyone travelling for hospital treatment, not only cancer patients. Hospitals in the north-west of England provide specialist treatment for Isle of Man residents when needed. Breast Cancer Support said making the journey could be "difficult" for people undergoing chemotherapy or accompanying vulnerable children. A spokesman said: "We know that just a few minutes of peace and quiet can make all the difference. "It's a chance for people to have a comfy seat and take a few minutes out. We think it'll make a massive difference. Many island charities have come together to make this happen". The Isle of Man government said "tens of thousands" of people travel away from the island for hospital treatment each year. A similar room is expected to open at Liverpool's John Lennon Airport later this year.